Volunteer Denise with a VIDS student in Hanoi. “My two weeks teaching in Vietnam went by all too quickly. While my trip was focused on teaching English to researchers at the Vietnamese Institute for Development Strategies, it is I who was the student. I learned so much about Vietnam from my students through informal conversations and visits to cultural, historical, and regional sites. Volunteer Denise teaching a Vietnamese student. So did this experience change your life? Did you have an opportunity to wage peace through understanding? 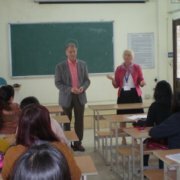 Learn more about teaching in Vietnam with Global Volunteers. Visit our volunteering in Vietnam page to learn how you can teach conversational English to children and adults in schools and offices. Teams are scheduled for one and two weeks throughout the year.